• Homeownership is an investment in your future. • There’s a reason homeownership is called the American Dream. Home is where we make memories, build our futures, and feel comfortable and secure. 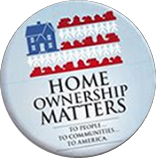 • Homeownership strengthens communities. Homeowners are more likely to be involved and engaged in local issues and move less frequently than renters. This helps prevent crime, improve childhood education and support neighborhood upkeep. Data shows that median homeowners had nearly $200,000 in net worth or 36 times that of the median renter who had just over $5,000. The median value of owners’ homes was $170,000. Many households own a primary residence (65.2 percent). It is the most commonly held non-financial assets after vehicles (86.3 percent).